Killer whales, also known as orcas, are the largest member of of the dolphin family. They live in oceans around the world, from the Pacific and Atlantic all the way to the Antartic. Orcas are very highly social creatures and stay in family groups called pods. They also hunt in groups and with very sophisticated techniques and communication. Orcas also have a diverse diet: fishes, seals and dolphins. The killer whales also bring an ominous tone, as it they have been recorded attacking and feeding on other whales. Orcas are majestic creatures, which is why they have such a passionate community following and protecting them. And while it is a once-in-a-lifetime opportunity to swim with them in the wild, there are many places where you can admire the whales from boats and land lookouts. Be sure to check out the photos from Bluewater Photo trip leader Ron Watkins' 40 minute encounter with killer whales in the Galapagos Islands! Below are some interesting facts about Orcas. Orcas, or killer whales, are found in all oceans and most of the seas. It is very difficult to make more precise distributional estimates due to the following: population density, pod numbers and enormous range. 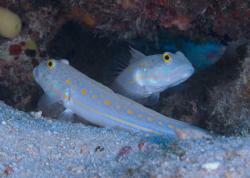 What's clear is that they prefer living at the upper latitudes and coastal pelagic environments. According to surveys, the highest densities of killer whales (>0.40 individuals per 100 km²) are found in the northeast Atlantic around the Norwegian coast, Aleutian Islands, the Gulf of Alaska and in the Southern Ocean off the coast of Antarctica. They are also considered "common" (0.20–0.40 individuals per 100 km²) in the eastern Pacific along the coast of British Columbia, Washington and Oregon. High densities have also been reported but not quantified in the western North Pacific around the Sea of Japan. 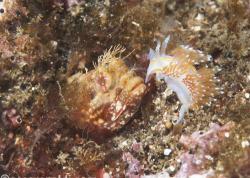 Population in the mid to lower latitudes of the North Pacific is unclear, especially in coastal waters. Large concentrations are known to occur north of the Northern Mariana Islands and Gulf of Sendai with multiple sightings also reported off Bali, the coast of Taiwan, mainland China and the southern coast of Vietnam. Migration patterns are poorly understood. Despite decades of research, where these animals go for large periods of the year remains unknown. Male killer whales typically grow to between 6 to 8 metres (20 to 26 ft) long and weigh in excess of 6 tons (5.9 long tons; 6.6 short tons). The largest recorded male killer whale on record was 9.8 m (32 ft), weighing 10 tons (9.8 long tons; 11 short tons)! Females are smaller, generally ranging from 5 to 7 m (16 to 23 ft) and weighing about 3 to 4 tonnes (3.0 to 3.9 long tons; 3.3 to 4.4 short tons). The largest female recorded was 8.5 m (28 ft), weighing 7.5 tonnes (7.4 long tons; 8.3 short tons)! Calves at birth weigh about 180 kg (400 lb) and are about 2.4 m (7.9 ft) long. Resident Orcas: Commonly found in the coastal waters of the northeast Pacific. Their diet mostly consists of fish and sometimes squid. One of the most distinct characteristics of a resident orca is that females have rounded dorsal fin tips that terminate in a sharp corner. The saddle patch (the gray or white area around the dorsal fin) often contains some black colouring. Transient Orcas: Transients roam widely along the coast and some of them have been sighted in both southern Alaska and California. They generally travel in small groups, usually of two to six animals. Their diet consists mostly of marine mammals. Female transients are characterized by more triangular and pointed dorsal fins. The saddle patch on transients is typically solid and uniformly gray. 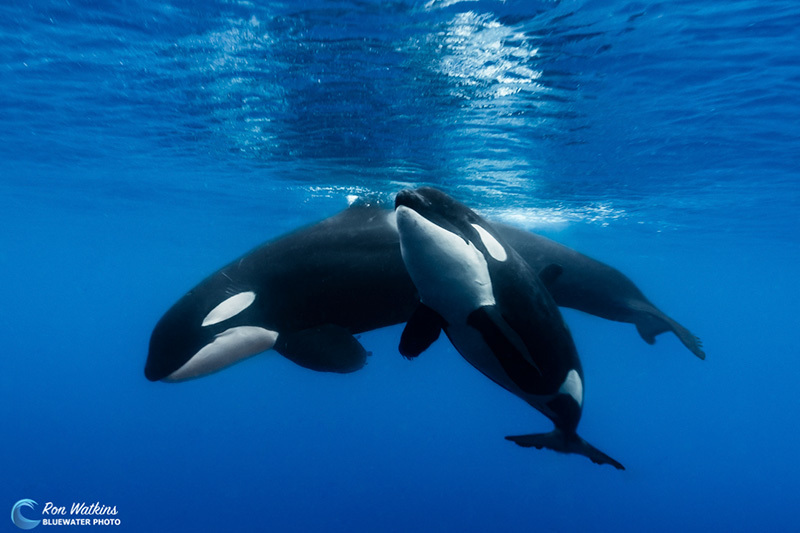 They are also referred as Bigg's killer whale in honor of cetologist Michael Bigg. Offshore Orcas: Offshore killer whales were discovered in 1988 in the northeast Pacific and have mostly been encountered off the west coast of Vancouver Island and near Haida Gwaii (BC, Canada). A group could consist of 20–75 killer whales but on rare occasions might reach approximately 200. They travel far from shore and feed primarily on schooling fish, though research suggests that they also eat mammals and sharks like the transient killer whales do. Offshores appear to be smaller than the others, and females are characterized by dorsal fin tips that are continuously rounded. * Transients and residents live in the same areas, but avoid each other. 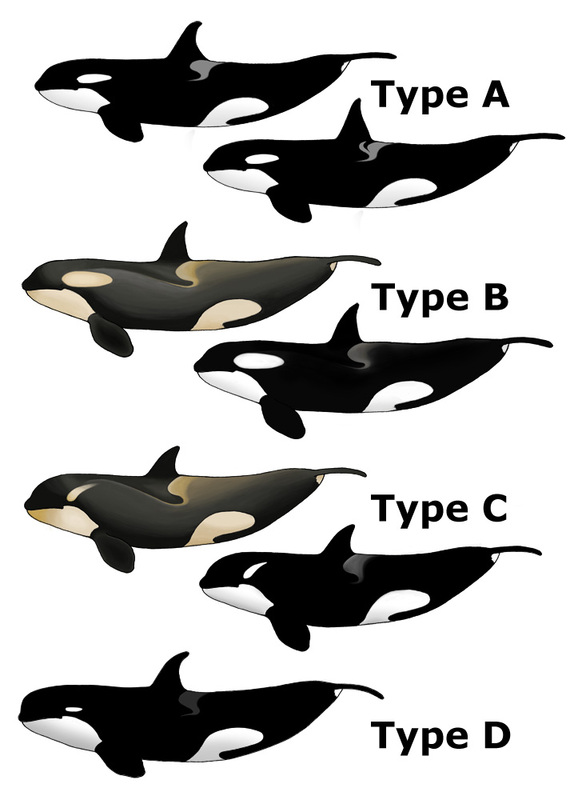 Type A - would look like a "typical" killer whale, a large, black and white form with a medium-sized white eye patch, living in open water and feeding mostly on minke whales. Type B - is smaller than type A and it has a large white eye patch. Most of the dark parts of its body are medium gray instead of black, although it has a dark gray patch called a Dorsal Cape stretching back from its forehead to just behind its dorsal fin. The white areas are stained slightly yellow. It feeds mostly on seals. Type C - it is the smallest type and lives in larger groups than the others. Its eye patch is distinctively slanted forwards, rather than parallel to the body axis. Like type B, it is primarily white and medium gray, with a dark gray dorsal cape and yellow-tinged patches. Its only observed prey is the Antarctic cod. Type D - was identified in photographs from New Zealand in 1955 during a mass stranding and since then through six at-sea sightings since 2004. It is immediately recognizable by its extremely small white eye patch, narrower and shorter than usual dorsal fin, bulbous head (similar to a pilot whale), and smaller teeth. Its geographic range appears to be global but within latitudes 40°S and 60°S. Killer whales are apex predators, meaning that they themselves have no natural predators. Their prey varies from fish, mammals, sea birds, sea turtles to sharks. On average, a killer whale eats 227 kilograms (500 lb) each day. In 2005, the United States government made a move to list the southern resident community of killer whales, which is comprised of three pods which live mostly in the Georgia, Haro Straits (British Columbia) and Puget Sound (Washington) as an endangered population under the Endangered Species Act. These pods do not breed outside of their community, and the population shrank to around 90 from 200 killer whales. An October 2008 annual servey revealed that 7 killer whales where missing and presumed dead. That same year, the International Union for Conservation of Nature (IUCN) listed the killer whale's conservation status as an endangered species. In September 2008, the Canadian government decided it was not necessary to enforce further protection of the orca population, which was still of great concern for conservationists. Six environmental groups sued the federal government in response to the decision, claiming killer whales were facing many threats on the British Columbia Coast which led to Fisheries & Ocean Canada (DFO) protecting habitat of the killer whales. Today, orca whale watching is very popular in the Puget Sound and BC areas. If you'd like to become involved or learn more, check out the work of the non-profit organization, Whale Scout.